Innocent (definition) = Not guilty of a crime or offense; not intended to cause harm; pure and uncorrupted by evil, sin or experience of the world; more trusting and naïve than most through lack of experience of life or failure to recognize the motives of others. I contemplated the true meaning of this word today after returning from my daily run, where an encounter with a sweet Dachshund named Sophie had touched my soul. Sophie exuded happiness in the present moment, happily walking down the street with her guardian, a trot in her step, with seemingly not a care in the world. As I approached, Sophie greeted me with joy, a sparkle in her clear blue eyes, as she ran around in circles with excitement. I was speechless for a moment, then gasped at the very thought that a human being would commit such an unconscionable act. Through my years of research on animal welfare, I am well aware of the horrors and inhumane cruelty of many industries, including the puppy mill industry and the deplorable conditions in which these innocent souls barely exist. But going to the extent of silencing a sentient being by cutting her vocal cords was crossing the line of morality. Such a barbaric act can only be defined as a mental aberration. All for the sake of profit and greed. The perpetrators and the people who support such atrocity disconnect from its cruelty and perpetuate the condition. Unless we heal the source of inhumanity, the disease will prevail – any lesser remedy will be akin to applying a band-aid to a severed limb. The soul of the planet is at stake and its sustainability is in jeopardy, its reliance on a higher vibration to sustain itself. The energy of destruction must be raised to the energy of restoration. An evolution of the human spirit and resurrection of soul in the human experience is at hand. The animals, the earth, the human species are ONE. When we disconnect from our interconnectedness, we live a barren life separated from soul. When we disconnect from the suffering of sentient beings, we disconnect from our own suffering and our soul’s need to know itself. Sophie, like millions of innocents around the globe, suffered unimaginable cruelty at the hands of humans who, for all intent and purpose, possess the intellect to know better, but allow their choices to be driven by ego consciousness, the nemesis permeating our world, the “condition of disconnect” in our society. The faint sound of Sophie’s bark spoke volumes. The time of awakening is upon us. Max was relinquished by his owner to an animal control facility when he was six months of age. If he had not been rescued, his life would have ended abruptly as do the lives of millions of companion animals each year. Max is a great communicator. He communicates that those who abandon animals are disconnected from the earth. Your ability to see, hear and speak the truth and be such a powerful voice for these angelic beings is truly a blessing. I hope more people step up and voice the truth and do whatever they can do to make changes in this world, to take action in honor of these innocent loving beings, to fight for change, to change the laws, to stop the killing, to be an example to others, to create awareness. 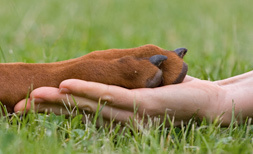 Animals are innocent loving beings who deserve to be honored, respected and treated with loving kindness. They are here to love, they are here for truth. Let everyone open their eyes and honor this, honor them, honor ourselves by setting such an example. All for one and one for all! Save the animals.